This is a place for all who appreciate foreign languages and culture. A place to share new words or figures of speech you picked up traveling. Or your own stories and progress learning a new language. This is a place where the effort to learn a new language is applauded, as opposed to ridiculed whenever a mistake is made. Those of endless negativity are invited to not participate. To get the ball rolling, one thing I always wanted to see was a castell, or human tower. Building them is a custom I find enchanting from southern Spain. I was fortunate to be in Barcelona on a Sunday where there was a gathering of castellers, or those who are part of the human tower. Please enjoy this video I put together. What you see in the video was about half of the event. I think in more serious competitions there is a flag the top child endeavors to reach, proving the height of the tower. This event I attended I think was non-competitive but you can still see the child on tip reaching for the air. Pretty much ever tower looked to be five people high. If you're ever in southern Spain, I highly recommend doing some research and trying to attend one of these events. For now, I would be happy to take any questions or comments. The question for the poll is which language do you prefer to discuss? away that you'll never meet. the number of languages, it's staggering. to get all these people to agree on anything. The mind boggles at how hard it must be to get all these people to agree on anything. 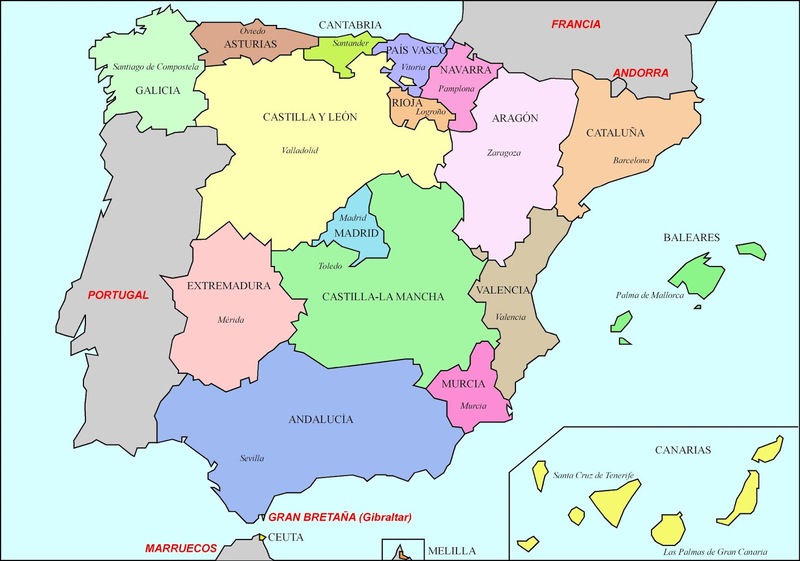 1) Aranese, co-official in Catalonia It is spoken mainly in the Pyrenean comarca of the Aran Valley (Val d'Aran), in north-western Catalonia. It is a variety of Gascon, which in turn is a variety of the Occitan language. 2) Basque, co-official in the Basque Country and northern Navarre (see Basque-speaking zone). Basque is the only non-Romance language (as well as non-Indo-European) with an official status in mainland Spain. 3) Catalan, co-official in Catalonia, the Balearic Islands and, as a distinct variant (Valencian), in the Valencian Community. It is recognised—but not official—in Aragon (La Franja). Furthermore, it is also spoken without official recognition in the municipality of Carche, Murcia. 4) Galician, co-official in Galicia. It is also spoken without official recognition in the adjacent western parts of the Principality of Asturias and Castile and León. California with a Population 39,536,653 (2017 est.) is approaching the size of Spain. Train travel in Spain is approaching France in speed and convenience. You can get from Madrid to Cordoba in less than 2 hours today. It does strike me as a shame that we don't have more traffic from foreign airlines to some of our larger domestic airports like LAS, MCO, ATL, DFW, DEN. Maybe Boeing's new B797 aircraft will help there. About 50% of air traffic across Pacific on US carriers goes through 3 airports (no shock). About 80% of air traffic to Latin America and the Caribbean on US carriers goes through 8 airports. I've repeatedly heard that phrase about "ten miles from where they were born" or other similar statements downplaying the amount of extended travel but I doubt they are quite historically accurate. I've mentioned before how archival records in Spain show the extent of travel in the Spice Trade and how religious orders were often involved in the slave trade. Ancient texts, even cooking texts, show how extensive travel was. Think of the spice trade wherein towns grew wherever a safe stopover for caravans and their animals was provided. Following the changes of rhubarb along the spice trail is fascinating. The Arabs had scholars whose manner of dress indicated that they were wanderers who met with wealthy merchants and exchanged knowledge with them. Europe often lacks physical barriers so borders tend to have historically shifted so travel took place both physically and administratively. Europeans have extensive language education which would never be the case if there actually was so little travel. One need only look back on the Kelley family who learned a new language each year because as buskers they traveled so much. Or just look at various Cruisers in the yachting world whose children learn a new language each Winter. Look at how cloudy UK types would buy condos in Spain and how UK ex-patriot communities would spring up in Europe and then often fail when the economy turned. Look at how USA pensions resulted in settlements in Eastern European countries. Gold and Currency travel and of necessity so do people. Of course in Spain it backfired on the sunshine seeking English ex-patriot communities when the Gypsies moved in and told the Spanish police to "beat it". It also backfired when Spain no longer considered the English Pound so valuable and decided to make Spanish health care far less available than it had been. In Central America the expatriate communities generally thrive even when the periphery have gunfire because everyone knows the gunfire is between guards hired by Oriental owners of mining interests and revolutionaries; no one is shooting at the USA and European expatriates who provide so much currency. Some towns have signage in English, French and German despite the official language being Spanish which can be rarely heard in commerce. The Chief of Police may speak Spanish but the Fire Department speaks English because their fire truck and their ambulances were all donated by the merchants. There used to be a Lingua Franca that was spoken along sea shores the world round. Sailors and merchants communicated quite comfortably in a polyglot that consisted of largely bad grammar in several languages. Now its mainly English for world travelers. Even in the booming economies of China and Japan English language teaching is a well paid profession and often free rent and free meals are available to English speakers who will live with an Oriental family for several months. No matter how much the ascendancy of Spanish is discussed, it seems English is more valued. I used to attend a chat room wherein an Argentinian friend would initially make use of a dictionary and some chat=room assistance. Now he is fluent and facilitates an English After Work group in Argentina. No mater how much Portuguese and Spanish grow, English grows faster. My cousin's wife, who lives near Frankfurt, also subscribes to the "ten mile" theory. She said only traders covered a wide area, while farmers and tradesmen never had reason to leave the village. I imagine young men might have roamed off if there were no suitable women in the town. Even my grandfather did that, showing up out of nowhere in a small town in Germany, with skills as a baker, and marrying my grandmother, whose family already had a bakery. I'm not an expert, but 500 years ago Europe must have seemed a huge place and it was just too big to keep a common language going. It is human instinct to not like people who don't look like you and I think language and religion are a way to culturally isolate yourself from those strange people on the other side of the river. Oaxaca State in the present day in Mexico is about the same physical size as Indiana, with a little more than half the population of Indiana. They speak 15 native languages there. Many people know Spanish in the cities, but in the mountains a lot of people speak only the indigenous languages. Benito Juárez was born in 1806 (pre independent Mexico) only 35 miles from Oaxaca City, and didn't speak a word of Spanish. He worked in the cornfields and as a shepherd until the age of 12 when he walked into the city seeking an education. He died as President of Mexico. When I moved to the small town I live in now at 12 I was surprised at how little most of the other kids had travelled. I had been to Ontario and points in between several times. Was down to Vancouver on a regular basis. Probably half the kids I went to school with had never been more than 100 miles from home. Many of them had never been 50 miles from home. 10 miles for the average person a 100 years ago seems quite likely true to me.